The 'Dog's Brexit' thing has worn me out now. That, and President Gump's inauguration. The scale of the switcheroo in the world's understanding of itself has become exceedingly wearing of late. After my last post I found that the temptation to change it on a daily basis to accommodate the shifts and slides in perception of events just too much to handle, although my basic premise remained unchanged. I can see how journalists can become so frenetic at the constant change of things. I have to be very careful what I say about President Gump because I have many dear and beloved American friends and family some of whom think he is just the very man to set America back on track. Perhaps he is and I most certainly mean no offence to anyone who holds that belief. But in my view he is almost as presidential as a bowl of porridge, but with much less substance. Just to prove that however clever I might think I am, someone else has got the idea first. Donald Gump is undoubtedly a good businessman. He wouldn't be a billionaire otherwise. However, there are plenty of good businessmen who are not as rich as Donald Gump. One of the Gump-quotes that I saw was One of the key problems today is that politics is such a disgrace. Good people don’t go into government. Thanks for that insight, Don. What I am finding difficult in this whole thing is the 'reality denial' that Donald Gump exhibits. It is very like his fictional counterpart Forrest Trump. You will remember the movie ... Life was like a box of chocolates. You never know what you’re gonna get. And how about these words of wisdom ... Stupid is as stupid does. Thanks, Mr President. The point I am trying to make. of course, is that fiction and reality have become confused in the Gump presidency. I'm A Citizen, Get Me Out of Here! Most of those friends and family that I know who have voted for Gump have said that Hillarious Clinton was so much worse. Crooked Hillarious, Gump called her ... and the epithet has stuck. 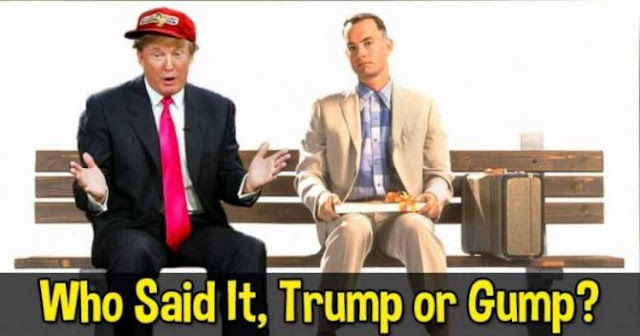 I am not a supporter of Hillarious Clinton, nor am I an admirer or Donald Gump, but I would rather go with Crooked Hillarious than trust a fictional Donald Gump. I couldn't cope if he was for real. Who knows what you're gonna get ... maybe Heffatrumps and Woozles? with apologies to Walt Disney and whoever wrote a really quite lovely little song until I messed with it.